With the COP21 UN climate change conference going on in Paris, questions about how the global environment will change in the coming decades and what impact that will have on the people and communities that live in them are once again at the top of the agenda. Much of this discussion is, of course, informed by the computer simulations of possible futures for the Earth’s climate system that are now routinely used to both understand how the system works and project the details of how it might change under specific conditions. Modelling groups around the world now take part in coordinated exercises – Model Intercomparison Projects (MIPs) – with simulations designed to help us better understand the implications of some of the uncertainties and gaps in our knowledge of the climate and to feed into further studies of how the changing climate will actually affect societies on the ground. MIPs have become major global projects in their own right – CMIP5, the largest such exercise yet that fed into the IPCCs recent fifth assessment report, ran from 2008 to 2015 and had barely finished before planning for CMIP6 started. The number and complexity of climate modelling studies have largely followed the rise in available computing power since the end of the last century, going from niche exercises in aspects of atmospheric dynamics to models that attempt to cover every aspect of the Earth thought to be important for producing our climate. Today, most global climate models used for projections will not only include the physical aspects of the atmosphere and ocean, but also attempt interactively to model aspects of the Earth’s biogeochemical cycles that set the level of carbon dioxide in the atmosphere. A relatively recent development over the last few years is the use of so-called Earth System Models (ESMs) for making future climate projections. ESMs represent another jump forward in the level of complexity that we attempt to model. Rather than being simply physical atmosphere and ocean models with selected parts of the carbon cycle put in as required to serve the physics, ESMs are more holistic, including more complete descriptions of (for example) atmospheric chemistry, methane-producing wetlands, plant biogeochemistry and the complex network of feedbacks that link these things to each other and to the more traditional atmospheric physics. Such models require teams of researchers from a wide range of Earth science backgrounds to work together to build them – and very significant computing resources to run them. The UK has thus setup a national project to build a next-generation ESM for our climate modelling community, with NERC and the MetOffice jointly funding the effort to produce the (not very imaginatively named!) 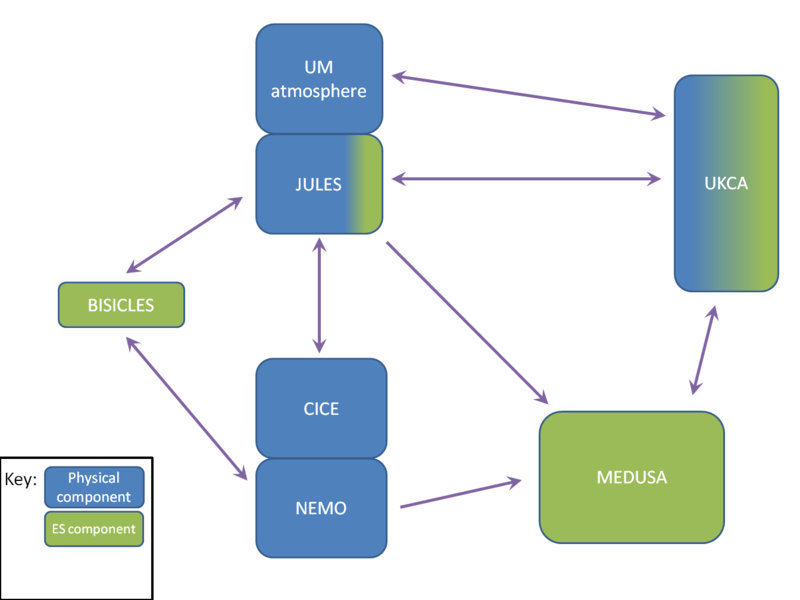 UKESM, the first version of which will be released for use in late 2016 (Figure 1). One of the major new pieces of modelling capability that will be built into UKESM will be the ability to model land-based ice. Terrestrial ice has some very strong feedbacks with the physical climate system – think of glacial cycles, with continental-scale icesheets covering large parts of the northern hemisphere – but ice has not been included in comprehensive climate models before now. There are both scientific and technical reasons for this. Land ice is generally thought of as interacting on much longer timescales than are considered for climate change projections, so is usually considered as a static boundary condition. There are also significant technical issues in coupling ice to global climate models. For example, it’s crucially important to use sub-kilometre spatial resolution in some regions to capture the essential ice dynamics, which is higher than can be used for most weather forecasting models, let alone climate models intended to run for many decades. The icesheet model that will be used in UKESM, BISICLES, deals with this problem by using an evolving, multi-resolution grid mesh that puts finer grid cells only in the regions where they’re required (Figure 2). To communicate with the fine icesheet grid, however, we need further to adapt the atmosphere and ocean models with schemes that provide the ice with some sub-gridscale information from the rest of the climate. Figure 2. 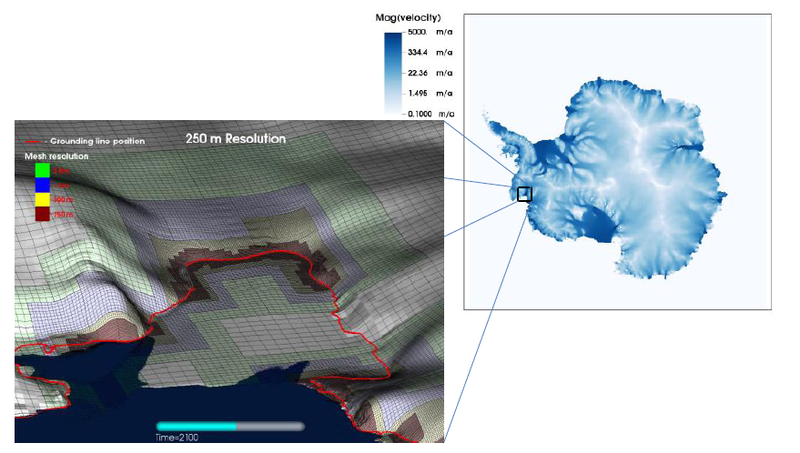 The multiresolution BISICLES grid in a simulation of the iceshelf in Pine Island Bay, Antarctica (Cornford et al., 2013). Land ice does not really exist as a static boundary condition, of course, even on climate projection timescales of centuries. Glaciers around the world are retreating and major Antarctic iceshelves are threatened with collapse. These changes don’t just affect the albedo of the Earth’s surface, but also the freshwater input to the ocean and the Southern Ocean deepwater formation that plays a key role in the global ocean circulation. There are major societal impacts associated with the changing ice as well, in terms of water availability to communities that rely on seasonal melt from glaciers and, of course, global sea level rise. Projections of sea level rise have until now been made by piecing together results from different types of studies done in different ways (Church et al. 2013). That is about to change, however, as a new international model intercomparison study, ISMIP6, will take the new generation of climate models, including those with interactive icesheets like UKESM, and use them to make fully consistent projections of sea level rise out to 2100 and beyond. Integrating icesheets into climate models is pushing at the boundaries climate modelling, both in terms of our scientific understanding and our technical abilities. The sheer computational requirements of a modern global general circulation model means that UKESM will only be able to resolve the largest icesheets and iceshelves at first, so will not have individual glaciers as part of the interactive Earth system. And although having ESMs with such a complex network of feedbacks undoubtedly opens the door to exciting new areas of science, all this additional complexity does come with drawbacks. For one thing, the atmospheric chemistry model alone makes UKESM several times more expensive to run than the equivalent UK Met Office model without chemistry. Another issue around increasing model complexity is that we know there are fundamental aspects of the core atmosphere and ocean physical climate system that are still not being modelled sufficiently well. We cannot yet run our century-scale climate models with enough resolution to resolve fully convection in the atmosphere, or eddies in the ocean. Nor can we fully model how basic cloud microphysics really operates in the context of the large-scale climate response. The development of ESMs doesn’t mean that we think these issues aren’t important. It is simply that different science questions require different modelling tools, and the new capabilities of ESMs like UKESM provide powerful new tools that will help us understand how important aspects of the Earth system interact, and, importantly, how they may change in the future to form the environments we will be living in. Church, J.A., P.U. Clark, A. Cazenave, J.M. Gregory, S. Jevrejeva, A. Levermann, M.A. Merrifield, G.A. Milne, R.S. Nerem, P.D. Nunn, A.J. Payne, W.T. Pfeffer, D. Stammer and A.S. Unnikrishnan, 2013. Sea Level Change. In: Climate Change 2013: The Physical Science Basis. Contribution of Working Group I to the Fifth Assessment Report of the Intergovernmental Panel on Climate Change [Stocker, T.F., D. Qin, G.-K. Plattner, M. Tignor, S.K. Allen, J. Boschung, A. Nauels, Y. Xia, V. Bex and P.M. Midgley (eds.)]. Cambridge University Press, Cambridge, United Kingdom and New York, NY, USA, pp. 1137–1216, doi:10.1017/ CBO9781107415324.026. This entry was posted in Climate, Climate change, Cryosphere, IPCC, Numerical modelling, Polar. Bookmark the permalink.